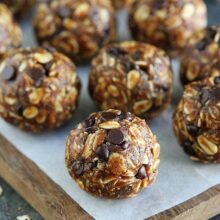 If you like all things pumpkin chocolate chip, you will love these easy, no-bake Pumpkin Energy Balls. 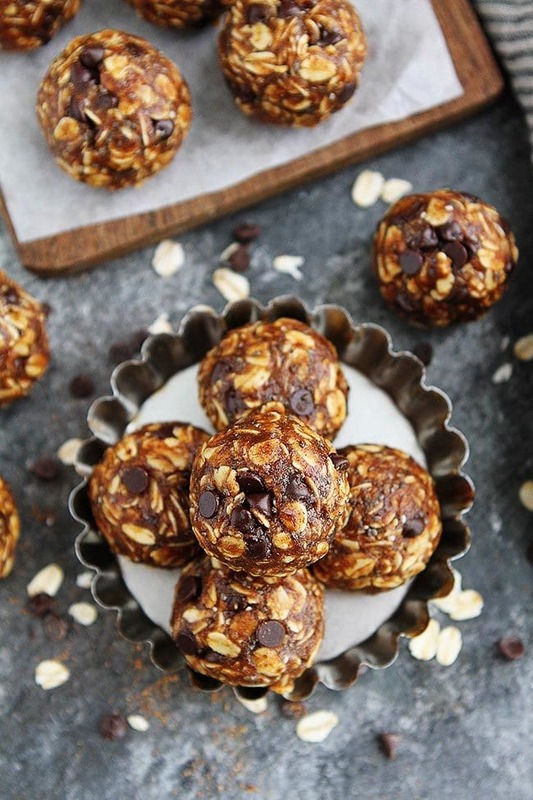 They only take a few minutes to make and are the perfect healthy treat for fall! I love pumpkin season because I get to bake up two of my all-time favorite pumpkin treats, pumpkin chocolate chip cookies and pumpkin chocolate chip bread. You can’t go wrong with the classic pumpkin chocolate chip combo. Well, this year I have a new favorite pumpkin chocolate chip treat, Pumpkin Energy Balls. And the best part? They are healthy and only take a few minutes to make. 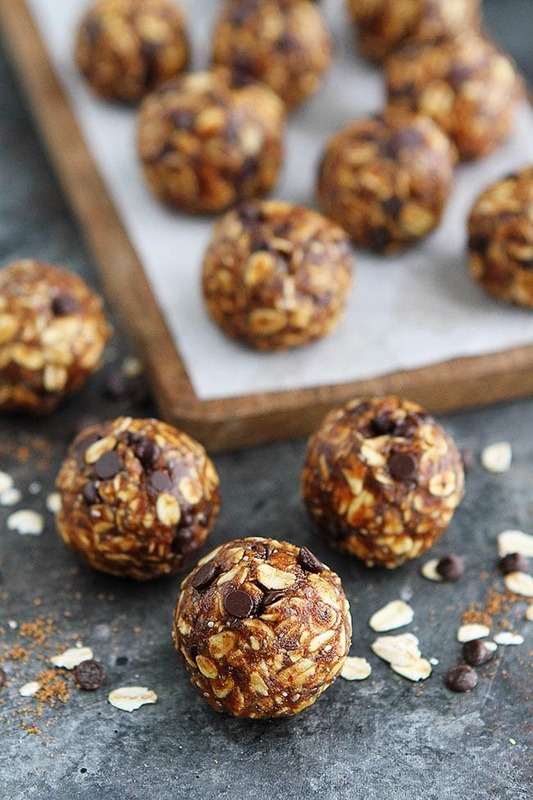 You don’t even have to turn on the oven because these easy energy bites are a no-bake treat! Yahoo!! Who’s excited? Both of my hands are raised! Let’s make some energy balls! You probably have all of the ingredients in your pantry to make the pumpkin energy balls. 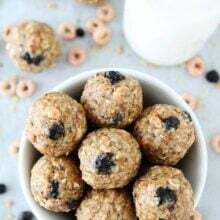 Old fashioned oats-I like to use old fashioned oats because they create a chewier, heartier energy ball. Plus, I always have old fashioned oats in my pantry. You can use gluten-free oats if you need the energy balls to be gluten-free. Ground flaxseed meal-I love adding ground flaxseed to boost the nutritional value of the energy balls. Ground flaxseed adds fiber, omega 3 fatty acids, and protein. Make sure you use ground flaxseed meal and not whole flaxseeds. Chia seeds-These little seeds are a loaded with nutrients and make a great addition to the energy balls. They add fiber, protein, healthy fat, calcium, magnesium, and antioxidants. Spices-Ground cinnamon, ginger, nutmeg, and cloves add lots of fall flavor to the energy balls. Salt-A little bit of salt is all you need, but don’t skip it! 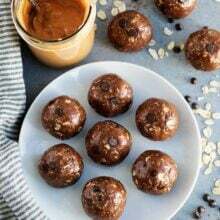 Almond butter-The almond butter is the base of the energy balls and makes all of the ingredients hold together. If you don’t have almond butter, you can use peanut butter, but I really like the almond flavor with the pumpkin. 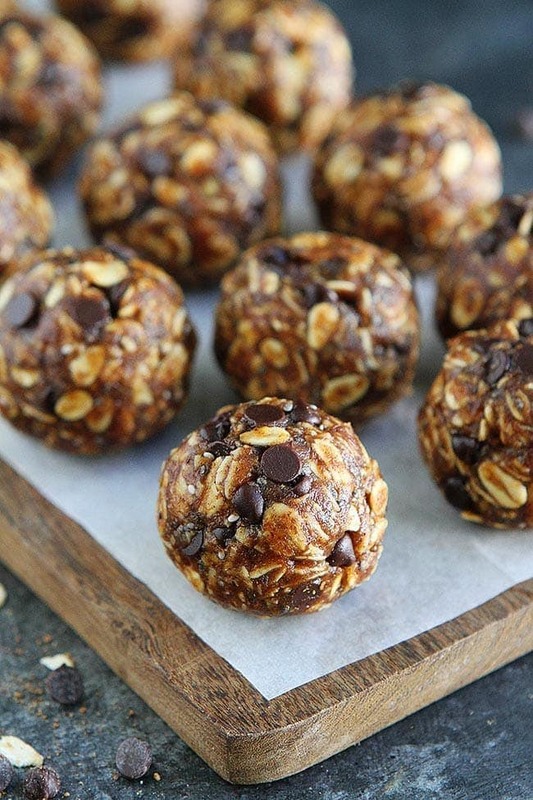 Honey-Sweeten the energy balls with honey! The honey also helps the energy balls stick together. Vanilla extract-A little splash of pure vanilla extract is always a good idea! Mini Chocolate Chips-Mini chocolate chips are the perfect finishing touch to the pumpkin energy balls. The pumpkin chocolate chip combo is always a winner. I love these mini chocolate chips because they are allergy friendly. If you don’t want to use chocolate chips, you can leave them out and add dried cranberries. Or add dried cranberries with the chocolate chips! You are going to love these pumpkin energy balls because they only take about 10 minutes to make. I like to make the energy balls in my KitchenAid Stand Mixer because the mixer makes it super easy. If you don’t have a stand mixer, you can stir together the ingredients by hand. There is nothing wrong with using a bowl and a wooden spoon or spatula. Mix together all of the dry ingredients to make sure the spices are distributed evenly. Add the almond butter, pumpkin, honey, and vanilla extract. Mix until all of the ingredients come together and a “dough” forms. Roll the mixture into balls, about 2 tablespoons per ball. You can use your hands or a cookie scoop to do this. Place the balls in an airtight container and chill in the refrigerator for up to 1 week. I like to keep these pumpkin energy balls in the fridge during the fall months so we always have a healthy treat on hand.The energy balls make a great grab and go breakfast or snack Our boys love them and they have no clue they are healthy. They think I am the best mom for letting them eat cookie balls for breakfast, ha! Treat yourself this fall and make Pumpkin Energy Balls! They are the perfect pick me up! These easy and healthy pumpkin energy balls are a great healthy treat for fall! In the bowl of a stand mixer, add the oats, flaxseed, chia seeds, cinnamon, ginger, nutmeg, cloves, and salt. With the paddle attachment, mix on low until ingredients are combined. Add the almond butter, pumpkin, honey, and vanilla. Mix until the ingredients come together. Roll the mixture into balls, about 2 tablespoons per ball. Place the pumpkin energy balls into an airtight container and store in the refrigerator for up to 1 week. Note-if you don't have a stand mixer, you can mix the energy balls in a bowl with a wooden spoon or spatula. Are there options that are nut-free for the almond butter. 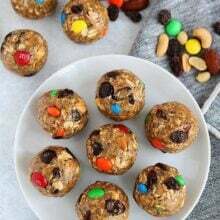 I love the idea of these energy bites and would love to be able to include some in my daughter’s lunch for school but the school is nut-free and nut butters are always the binder for these bites in the recipes I’ve seen. Thank you. Will it work with peanut butter instead? Will it taste okay still? Love this fall on-the-go snack! 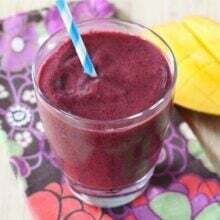 How would I incorporate protein powder? Swap it for something or just add? How much? Thanks!! Yum! You can certainly add protein powder. I have added a scoop of vanilla protein powder and they are delicious! I am a type 1 diabetic . Do you know the carb and calorie value of these delicious snacks! Yummy I made these today!! What’s the calories/ protein/carbs are per serving. Love the recipe, but it is very dense. I threw a few tablespoons of apple sauce in there and it was perfect! Mashed banana would probably work too if you like it little sweeter.